The choices we make, and the choices made for us, are what shape the people we turn into. This simple truth is at the core of the Korean drama Triangle. The series revolves around three brothers who were separated when they were young. Decades later, one of them has become a detective. Another, a crime lord. As for the youngest, he’s set to inherit his adopted parents’ vast casino empire. But what unhappy circumstances pulled apart, destiny will bring back together – only with such great divides separating the brothers, there’s no way their eventual reunion will go smoothly. Triangle combines several genres – crime, action, romance, and family drama – in a single thrilling package. It’s an extraordinary show, which explains why it’s been reproduced by so many pirates. In today’s article, we’ll be discussing a pirated Triangle DVD set so poorly made there’s no justification for its existence. Unless you’re new to online shopping, you’ve probably heard at least one or two eBay horror stories. The truth is, eBay is crawling with unscrupulous sellers who’ll deceive you into buying what seems like a high-quality item when it is in reality nothing more than a shabby bootleg. But eBay isn’t the only online auction service out there; equally as dangerous is Yahoo! Auctions, where we obtained our fake Triangle DVD set. As the DVD set gives us no information whatsoever other than the title of the show, it’s difficult to say who manufactured it. Perhaps the pirates were ashamed to make themselves known, given the shabby nature of their “product”? 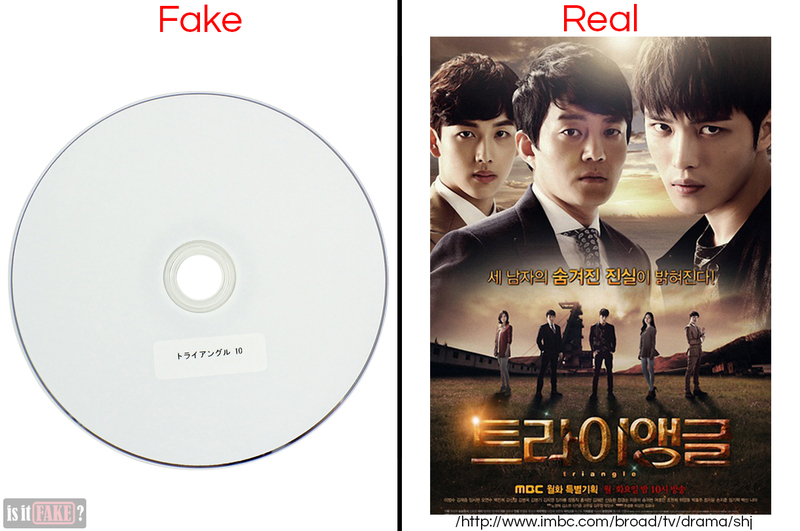 Clearly no effort was made to disguise the fact that these DVDs are pirated. 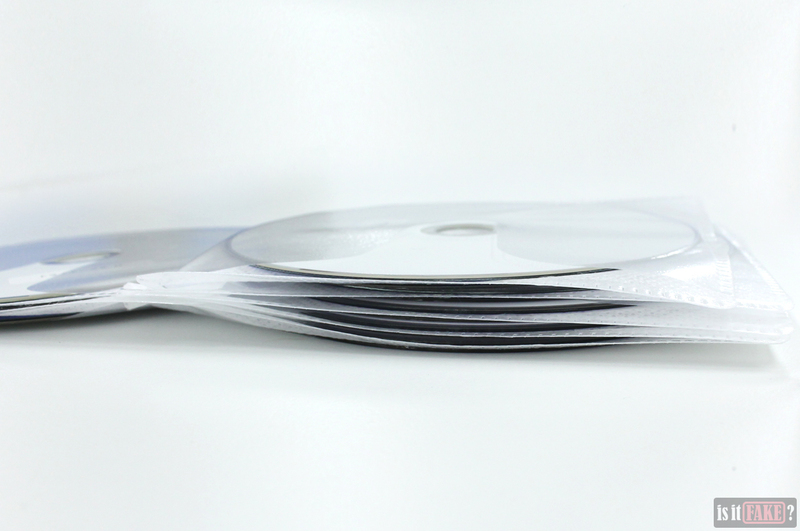 The 13 discs are packaged in plastic packets devoid of anything resembling art. You also won’t find any important details about the show. No Triangle logo, no synopsis, no cast of actors, no licensing or distribution information, nothing. 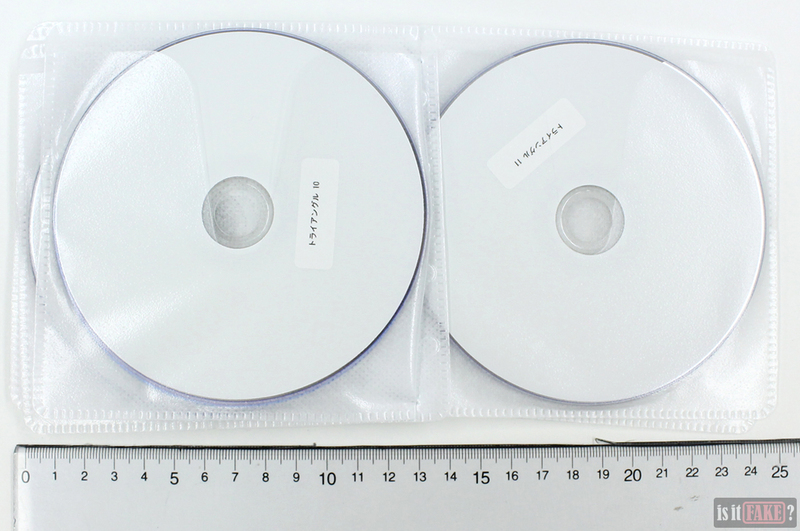 The word “Triangle” is printed in Japanese on top of each disc. 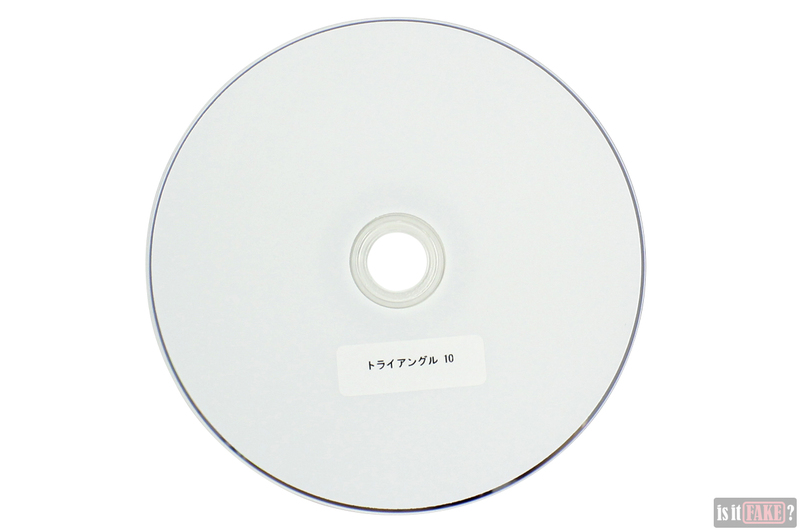 We’d like to say this is the only way you’ll know what’s contained in these discs; unfortunately, you’ll have to know how to actually read Japanese for the characters to make any sense to you. 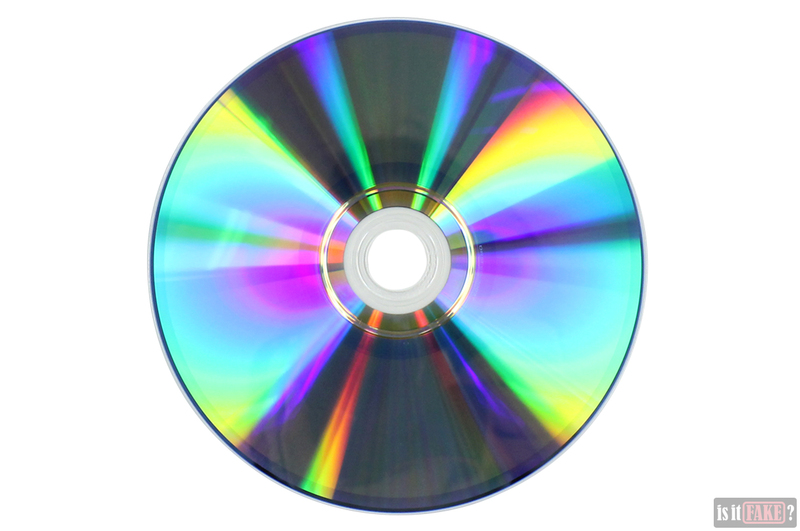 Each disc is also labelled a number denoting its position in the show’s chronology. Our media player had no trouble running the discs. The background image used for the main menu appears to be a stock photo, and thus not related to Triangle in any way. At the top is the title in Japanese. The two thumbnails are labelled with the title and episode number. The example above shows episodes 5 and 6. The episodes themselves are a revelation. For starters, we see the MBC logo on the upper right. This stands for Munhwa Broadcasting Corporation, the Korean television network that originally aired Triangle. This means these episodes were ripped straight from the MBC’s airing of the show on TV. On the lower right, we see the words “ShowBoom.” ShowBoom is an illegal Korean streaming service catering to Japanese audiences. 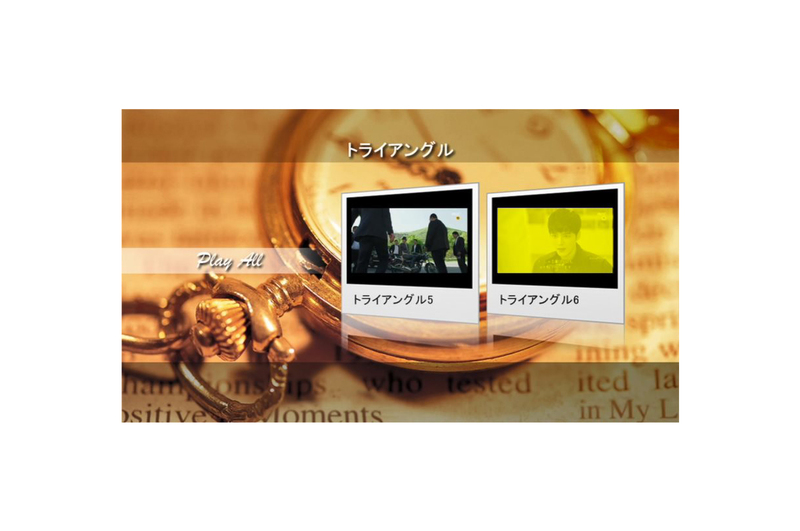 In exchange for money, the site allows viewers to watch Korean dramas with Japanese subtitles. 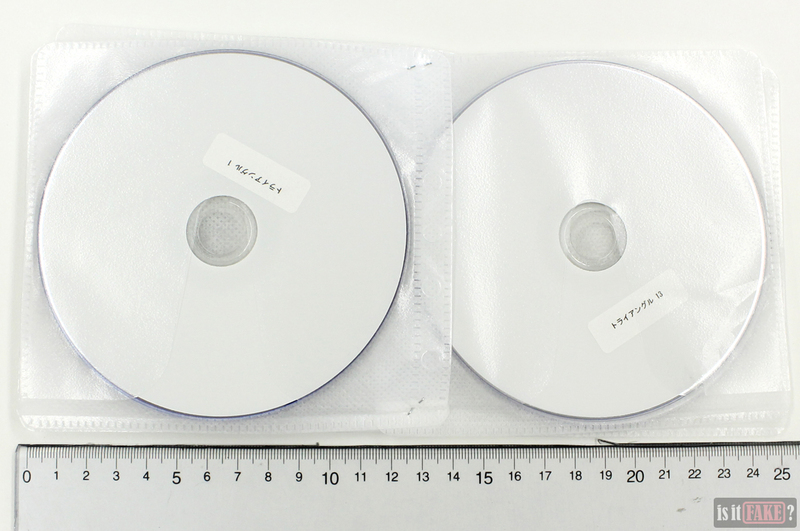 As you can surmise, these pirated Triangle DVDs also come with Japanese – and only Japanese – subtitles. So good luck if you can’read Japanese or understand Korean. The Japanese subtitles, however, don’t appear natural, and are even replete with translation, spelling, and grammatical errors. In other words, even if you can read Japanese, you won’t enjoy the show either. The shabby Japanese subtitles are proof they were written by Koreans and not Japanese natives, further solidifying these DVDs’ link to ShowBoom. And as if that isn’t bad enough, the subtitles are also pixelated. Lastly, the video quality is nothing to write home about. The picture is blurry, and only gets worse when you enlarge the screen. $16 for a set of pirated DVDs is preposterous. It’s even more insulting when you take into consideration the fact that you can watch Triangle online for free. You don’t have to spend a dime to watch Triangle on Viki, a free video on demand (VOD) service that boasts hundreds of movies, television series, and variety shows from Asia and elsewhere around the globe. While many of its titles are available worldwide, some can’t be accessed in specific regions. 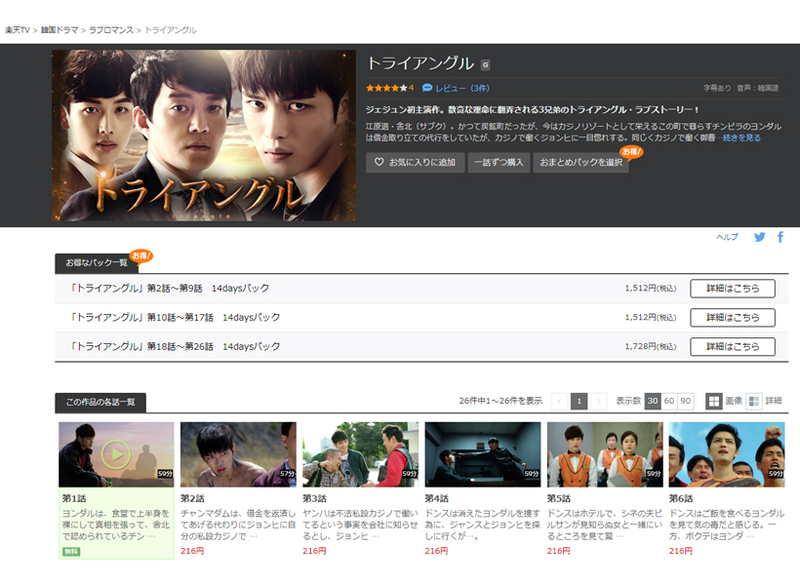 Triangle is also available on Japanese video streaming services U-Next and FOD. These sites offers free trials, so you can watch hundreds of shows from all over the world without spending a dime. Alternatively, you can catch Triangle on Pooq, which is like the Korean version of Netflix. 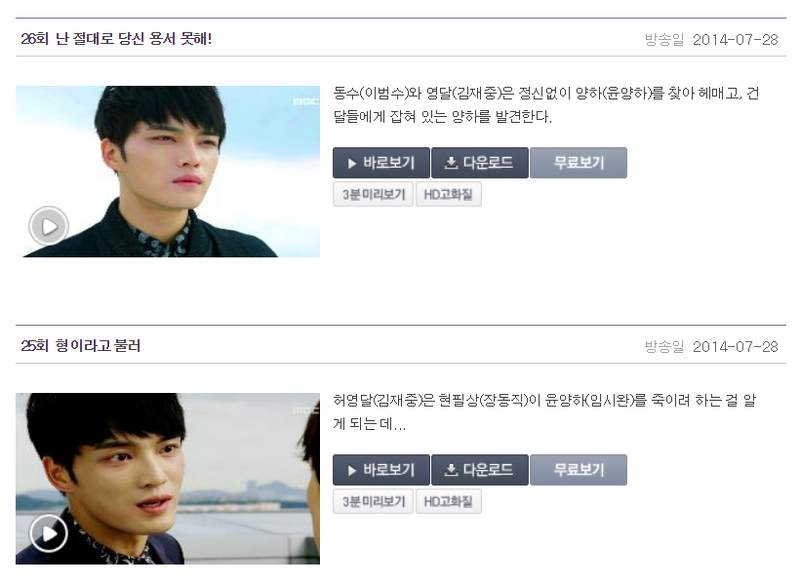 It offers shows from MBC, SBS, and KBS, which you can watch for free if you avail of the 15-day free trial. 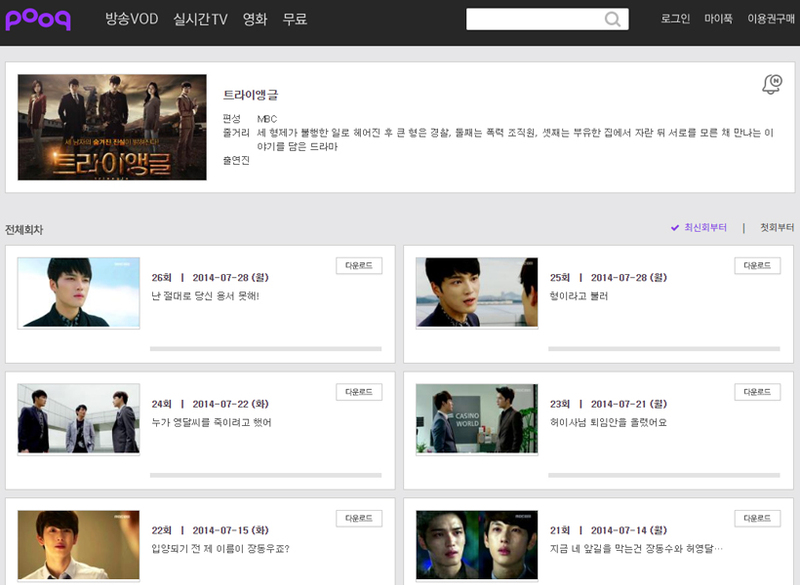 Other Korean sites were you can watch Triangle include One Store, Naver Store, and SBS. 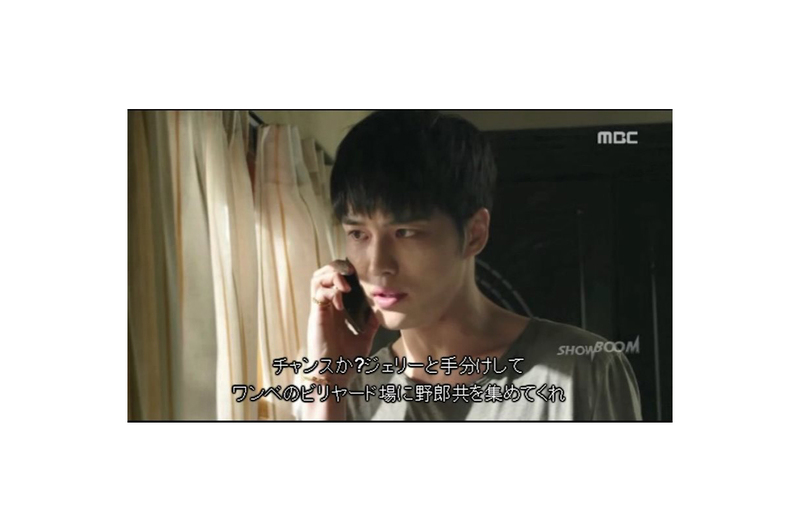 Of course, you can go right to the source of the show: MBC. You’ll be required to pay a subscription fee of between $1 and $4.6, however. 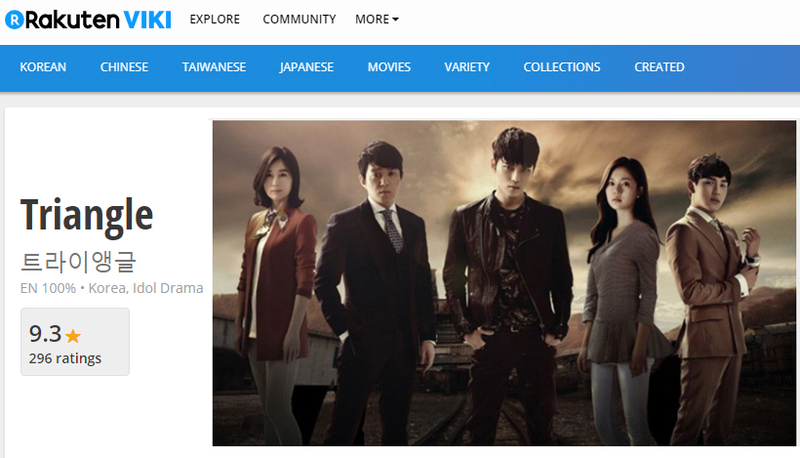 Those in the USA and Canada can watch Triangle and other Korean dramas for free on DramaFever. Subscribing for a monthly plans grants you additional benefits. Similarly, OnDemandKorea is an American VOD dedicated to streaming Korean shows. 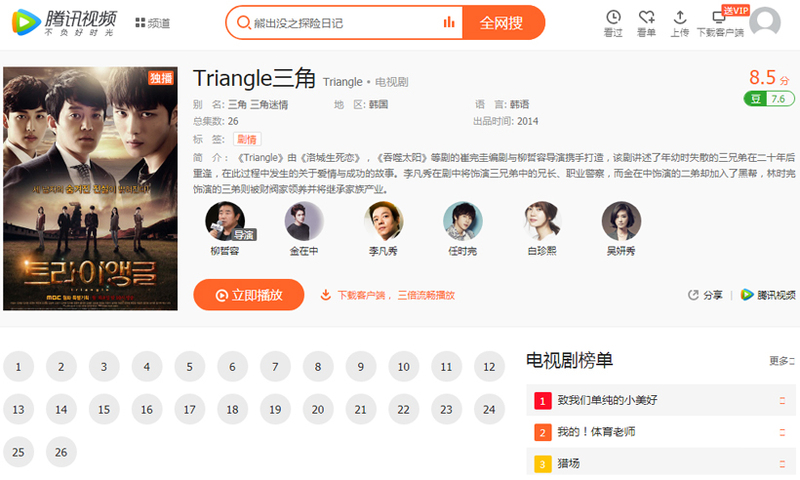 Those in China need only visit VOD Tencent Video to watch Triangle. 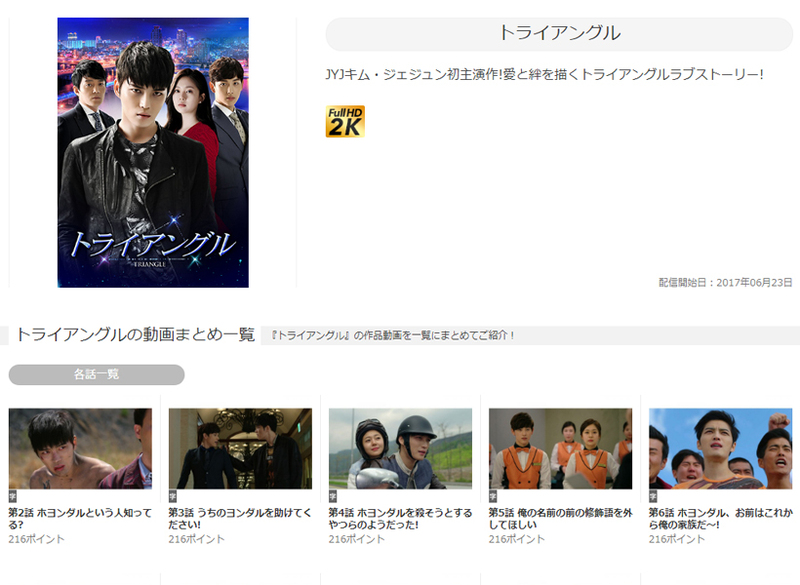 Another legal Chinese VoD that has Triangle in its catalogue is iQIYI. Triangle is also available on French VOD DramaPassion. If you’re looking for other legal VoDs, check out our Get-Dramas page! Even an intense, captivating show suffers if its presentation is substandard. This fake Triangle DVD set does the series no justice; it has no other subtitles aside from Japanese, and even those are written poorly. If you’re hoping for wonderful sights, you’ll be in for a disappointment, as its video quality is mediocre. All that, and the DVD set has zero display value, courtesy of its sad excuse for packaging. We’re giving it a 90% terrible rating.